October comes with the colder days. Dresses the trees in gayest attire. Into great heaps that all may admire. This is Fair Week but not so the weather. Not going this year, so I won’t take it as hard as some. Milton Fairgrounds (This picture may have been taken a few years after Grandma wrote this diary entry). Photo source: Milton History. org. Used with permission. Saw a flying machine whirling aloft in the air for at least 10 minutes. I think twas quite a sight to see. The word fair, as now used in America, has lost much of its Old world meaning. In this country the fair, whether we call it a world’s fair or a state fair, a county fair or district fair, is an industrial exhibition. And this is as it should be. It places the fair on a strictly business basis; it makes of it a practical, helpful thing. Conducted on an industrial, practical line, the fair is designed to help both the farmer and the city resident. It is the common meeting ground of all classes. At the fair the man who produces and the man who buys, the grower and the manufacturer, get together. They learn what each is capable of doing, and ascertain each other’s need. It is remarkable how much benefit we can get out of the fair when we attend filled with a desire to learn—to gain something worthwhile. The farmer who is seen “taking notes” at a fair—jotting down the name of this big apple, the weight of that monster pumpkin; who writes down all the information he can get about caring for hogs, poultry raising, feeding; who investigates the new kinds of machinery, and secures all available figures about up-to-date methods—that farmer will make his trip to the fair a valuable thing. He can do this and still have plenty of time to accompany his family to the side show, to take a whirl on the merry-go-round, or throw a ball at the doll babies. Posted on October 1, 2013 August 26, 2015 by SherylPosted in Farming and Gardening, MiltonTagged 1913, family history, genealogy. Indeed, why isn’t she going? Saving her money for something else? It would be interesting to know what she was saving it for. I think that the agricultural extension services helped found the fairs in many places–so there was a focus on farming, education, etc. What a mystery! I always thoughtthat the Fair was one of the highlights of the year an not be missed! The poem is so sweet. They seem so appropriate for Grandma to write when she’s so busy helping with the corn harvest. Very interesting! Maybe the bad weather put her off? Fairs are pretty grim in teeming rain… The October fair in the village where Norah, ‘my’ English diarist, lived is still going. It was always known as The Wakes and was the highlight of the year when I was a child. It has long been entirely fairground rides, which line the main street (and cause the shops to close – shopkeepers hate it!) It would be interesting to know at what point the ‘harvest’ element disappeared. Sometimes I think that it occurred gradually in many places where there were fewer farmers than there once were. Sorry she missed the fair, but I don’t intend to miss the State Fair of Texas this year. Fletcher’s Corny Dogs – YUM!! I’ve never had a Fletcher’s Corny Dog, there’s nothing like corn dogs at fairs! Grandma’s entries often leave us with questions…. Grandma’s got talent. And more words than usual. A pleasure. Thanks. Interesting that she was not going, there must be a good reason…I have always pictured that these fairs were among the biggest “happenings” back then. I also picture them being major events back then. Ahh so it’s like a farmer’s market with rides! 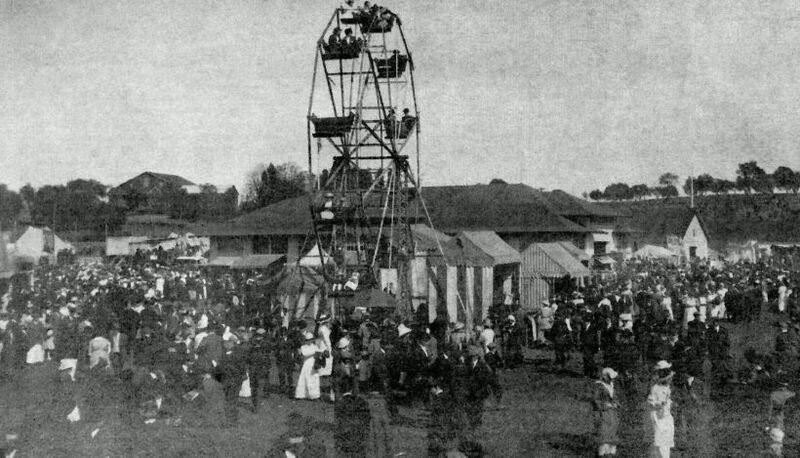 Fairs, church, picnics were more exciting back in Helena’s day I think because that is when you got to see everybody. The rest of the time, although you may have company, I would imagine you were managing the household and farm. Today we can interact via social networking, texting, phones, etc. Back then it was more important to see people face-to-face at local events. Sometimes I think we are missing something now. I wouldn’t want to miss the fair but if the weather was cold and rainy I would probably stay home. Wouldn’t it be fun to read a book about old fairs that has lots of pix? Sort of a coffee table book? What a fun book idea! Love how she gives us a new poem each month. Wish I knew if these were original or found! I’m still not sure–but over the months, I’ve gradually leaned toward thinking that Grandma wrote them. I used to love going to the fairs of days gone by. Sometime I think, where has the magic gone? Somehow it seems different today–though I know lots of people who really enjoy fairs. I believe that people think that fairs are more like carnivals. Which reminds me I need to do a post on carnivals someday. I have great memories of exhibiting at our county fair. I won a few ribbons that I still have tucked away somewhere. I also have good memories of exhibiting fruits, vegetables, and flowers (as well as showing cows) at the fair. Our fairs, in the Shenandoah Valley, and adjoining mountains, tend to occur in late July and August. They are annual events that folks here look forward to each year. Now we are seeing the color of the trees change, and Heritage/Homecoming Weekends are in order. Folks work all year preparing for these events. Nice to know that in rural communities, some events cannot be purchased any week/day of the year. I agree! The fact that events like fairs only occur once a year make them special. Your grandma sounds perfectly content to stay at home during this particular fair. I wonder if she has a secret boyfriend.